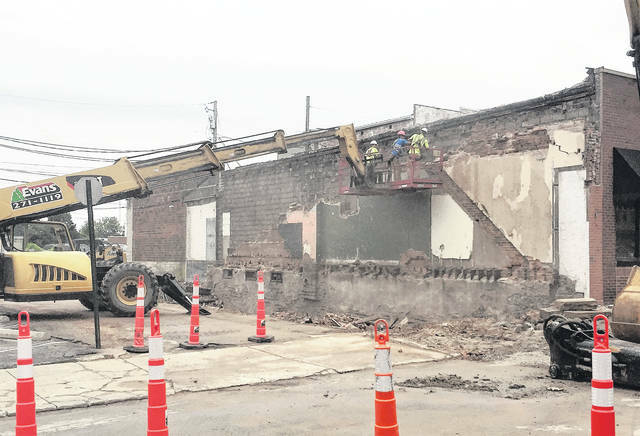 Workers are shown Monday taking down by hand the remaining wall of the former Armintrout building that was mostly demolished last week. The demolition project is expected to wrap up by Wednesday with the filling-in of the building’s basement. Demolition work on the former Armintrout law office on Gov. Trimble Place will likely be wrapped up by Wednesday, according to the crew supervisor. Evans Group supervisor Dave McLaughlin said Monday his crew will be filling in the basement of the building with stone, bricks and concrete, topping it off with gravel, both sand and limestone gravel. The demolition began last week, culminating primarily on Thursday when McLaughlin operated the big crane and bucket to take down the building piece by piece. On Monday, crews were dismantling by hand the last of the wall that abuts the offices of The Times-Gazette. McLaughlin said he would be jackhammering several holes into the basement floor early Tuesday morning to allow for moisture drainage before the fill-in gets underway. Hillsboro Mayor Drew Hastings, who owns the building, plans to use the space to create private parking for tenants of the old city building which he purchased in 2009, including The Times-Gazette. The $30,000 project was part of the city’s demolition assistance program. Like others who have participated in the program, Hastings will repay the city through five years of assessments on his property taxes. He purchased the Armintrout building last year from John “Buck” Wilkin after a proposal fell through for the city to purchase the building for demolition and public parking in conjunction with the creation of a plaza that would have covered what is now Governor Trimble Place. The city is proceeding instead with the creation of a smaller “green space” area on the north side of Trimble that will include grass, benches, new pavers and new lighting. A new decorative clock has already been placed. Work will resume on the small park once the demolition project wraps up. https://www.timesgazette.com/wp-content/uploads/sites/33/2018/06/web1_demo-pic-6-25-18-this.jpgWorkers are shown Monday taking down by hand the remaining wall of the former Armintrout building that was mostly demolished last week. The demolition project is expected to wrap up by Wednesday with the filling-in of the building’s basement.